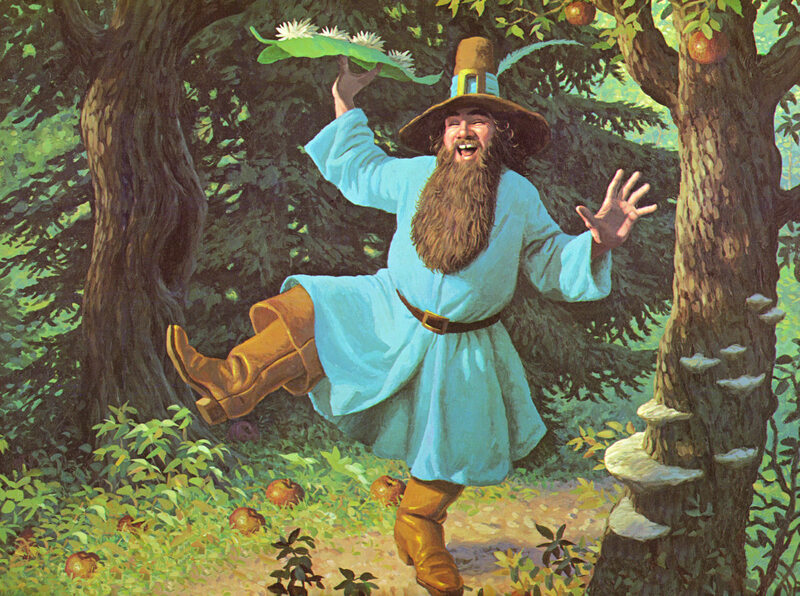 In The House Of Tom Bombadil | Jeremiah Was A Bullfrog... Now He's Eastern Orthodox? The hobbits grew up just on the other side of a wall that separated them from a forest called The Old Forest. In the middle of the forest was a strange character and his wife. In his house, all the terrors of the conscious woods were unable to come. An entirely unexpected character found in an unexpected place, that you think you know. The hobbits thought they knew all about the Old Forest, but they missed what was right in front of them. That’s kind of how I felt this past weekend. I went up to a town called Etna, in Northern California, for a family wedding. Years ago I had worked there for a summer, and became fairly familiar with the small town of less than 800 people. This area, known as the Scott Valley, was founded by settlers who came in on covered wagons nearly 150 years ago. They turned a bog into fertile ground for crops. The people made their communities, in which they take pride. Many of them have been here for several generations. Whatever their denomination or belief, they have helped each other without question, and been one another’s support. Nothing much changes here, and probably never will. It wasn’t hard learning to figure out my way around, and I thought I had a good grasp of the local area. What was hidden, just around the corner from me, I recently discovered. When I first learned about the Eastern Orthodox Church, I saw that some of their materials were printed in Etna. Etna? you mean that little town in the middle of nowhere? Apparently. I recently came in contact with the Convent of Saint Elizabeth Duchess of Russia. This convent was located less than a mile from the camp I spent my summer of 1994 working at. I had no idea it was there. Then again, at the time, I never knew about Orthodoxy. I called and ordered a couple of icons for my daughters, and prayer ropes. During the course of the conversations I got word that the Abbess had blessed a tour of the convent when I came to pick up the items. I was excited about the opportunity to see an actual monastic community. I brought my two older girls, so they could learn something about the way faith is lived out in a monastic type community. I had a hard time finding the road the Convent was on to start, but once I found it, I couldn’t believe I hadn’t heard about it before. The Convent is hidden from view of the main road, but very easy to see by their neighbors. In a town where people tend to know everything about their neighbors, it’s surprising that someone hadn’t mentioned their presence. I found out that the convent has been there for about 28 years, and the Monastery preceded it by several years. Within the past 10 years, a parish has been established (Sts Cyprian and Justina). Pulling on to the property, the surrounding woods were nothing out of the ordinary; dry pine needle ground cover under thin trees, and various brush and weeds. One of the nuns came out to answer the bell at the gate. Her name was Mother Justina. Inside the gate was a lush, green, well-kept landscape full of fountains, stones paths and gazebo type areas with icons. A very peaceful environment. After a very short introduction we were shown the Church building where services are held. A very small building, but very beautiful. Mother Justina told us the story of St Elizabeth, whom the convent was named after. Parenthetically, when we came home I found that our icon calender has St Elizabeth’s icon for this month. A great way to remind the girls of our visit. Mother Justina showed us the various buildings where the mothers make the wares that they sell, in order to sustain their convent financially. They make everything from Icons, Prayer ropes and the like, to vestments and woodwork items. I was informed that all the icons they print, are first painted by their master iconographer (Mother Justina, interestingly enough). Their list of icons is quite impressive. They embroider them, paint and print them. The vestments they sew are very beautiful as well. I did not see their wood shop. I imagine the advent of the internet has been good for monastics that have taken advantage of it. Here is a link to their convent: http://www.conventofsaintelizabeth.org . As we went from building to building, Mother Justina told us that each structure was built from the ground up by their own hands. Even the stonework that went into building the wall around the convent was done by the nuns. This was quite impressive. We were given a tour of their livestock. They had goats and chickens, and even a pony. We were told that each of the animals was a gift from the surrounding community at various times. They have even been given dogs. One was name Kermit. Kermit the Dog (and I thought nuns didn’t have a sense of humor). The vegetable and fruit garden had a good, healthy yield. Mother Justina said that while their neighbors have very poor water pressure, the convent seems to have abundant supply and pressure. A “small” testimony to the providence of God. The most impressive story was the one concerning their guest house and prayer chapel, dedicated to St Xenia. The adjoining property was once owned by absent owners who rented it out to tenants who abused it, to say the least. They littered the area with broken vehicles, appliances and general trash. They used drugs, were violent and a general nuisance. The abbess pled with the owners to do something about the tenants, but they would not. Apparently, all they were concerned with was getting rent money. The nuns asked to buy the land, but the owners were not interested. They were eventually forced to evict the tenants for illegal activity, but would not sell. They arbitrated through a realtor, to no avail. They began to offer daily prayers for the property and asked the intercessions of St Xenia. As the weeks went by, nothing changed. On the feast day of St Xenia the realtor called and told the abbess that inexplicably the land owners called, that very morning, and agreed to sell the property to the convent, on the abbess’ terms. I was glad to have my girls present to hear such a miracle done on behalf of God’s people. The tour ended with the mothers offering the girls a snack and a drink. They were very hospitable and gracious to us. The biggest challenge of the whole tour, was keeping my 5 year old (Shea) from being overly exuberant. She was so enamored with the animals, she would wait just long enough for Mother Justina to be done talking to ask about them. Her main obsession was the pony (of course). Trying to impress on her that we were in a community of people wholly dedicated to prayer and service, and not an amusement park of some kind, was a bit difficult. I was expecting the mothers to be a bit more stern, but they were very kind, gentle and gracious to the age of my daughter. Hailey (9) was her normal, polite self, and she seemed to pick up a lot of the tour. While the girls were enjoying their snack, Mother Justina told me how she was from Sweden, a country that claims 90% Lutheran, but 80% of them are really atheist. So it is quite a rarity that she should be the daughter of an Orthodox priest. She told us how her father’s village, during WWII, had hidden the Jews from the invading nazis. When a Jewish family was discovered and executed, the rest of the village refused to give the nazis the information they asked for. For this refusal, the kids (one of which was her father) were sent to concentration camps for several years. An amazing story of faith and kindness in the midst of suffering. The mothers offered to keep us in their prayers, as we did them. I hope to return there again someday with myself and my whole family as Orthodox. Another discovery was the parish. This was less than 1/2 mile from from the convent. The Church was dedicated to Sts Cyprian and Justina. We celebrated Liturgy with the parish of 10 people on Sunday morning. I was glad to have the whole family their. Quickly though, my wife became distracted by Liana (1) and took her out. After the Liturgy, the priest and others said she was well behaved. Gia thought she was getting too loud, but I knew she was okay, as there were two young ones in the service, who were the children of the priest. I think it was partially due to the fact that my wife is still uncomfortable in Orthodox services. Although our stay was limited to the Liturgy service, due to family obligations, I was joyed to find an Orthodox community tucked away in the midst of cowboy country.